Mark Varley and I met at the Scottish Restaurant on the A59, discovering that Rocket was confined to his nest after a night on’t ale in Accy and Alan McBride had ended up in a pub somewhere in Preston. 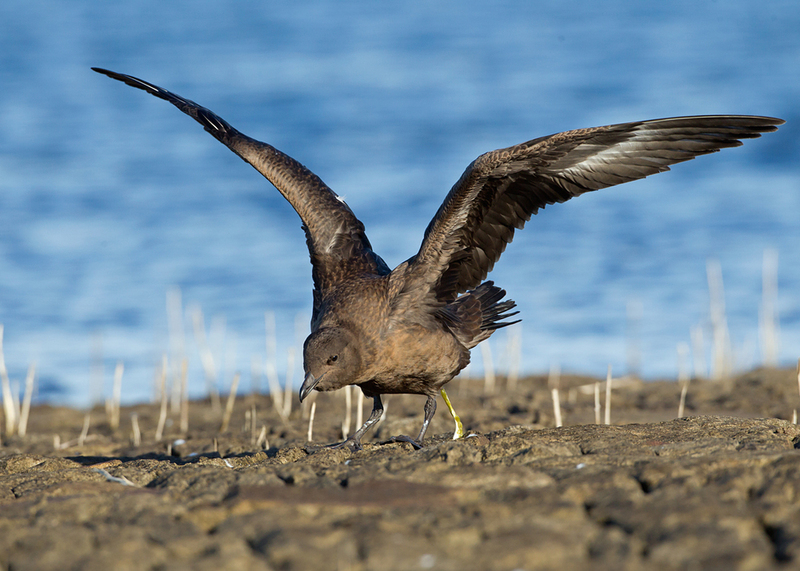 The previous day I had some time with the Great Skua at Audenshaw Reservoirs and managed a handful of frames while it dodged the RSPCA man with a net trying to catch it. On Saturday it had been zooming all over the reservoirs at full speed, harassing gulls but today it looked very sluggish and unwell. Great Skuas are rare inland in the northwest and I am still waiting for one in East Lancs but it was sad to see it looking ill today. As if the skua was not enough, a nice local birder asked ‘is it confirmed?’. It was - a juvenile Red-necked Grebe was not something we expected today but I heard later one was reported from here a couple of weeks ago. It is another local rarity so surely the same bird. Further north behind Bob's Smithy Inn, near Winter Hill, the four Glossy Ibises were still present digging up earthworms in the rough pasture and occasionally coming to within five metres range, their iridescent plumage shining in the afternoon sun. We even had time for a pint afterwards and all this without being shot at. Although it has produced some of my favourite artists like Morrissey and Buzzcocks I don't much like Manchester. CLICK ON THE IMAGES BELOW to scroll..